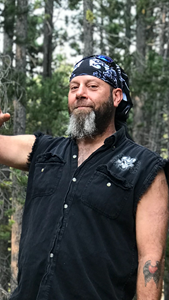 Christopher Hammond Jennings passed from this earth on September 1st, 2018 due to injuries received in a motorcycle accident on August 21st, 2018. Chris was born Oct. 28, 1969 in Del Rio, Texas to Loy Ann Harding and Robert David Jennings. Chris was raised in Sheridan, Wyoming where he discovered and displayed his love of music, motorcycles and friends. He was very talented in playing several musical instruments, but especially loved playing the guitar. He created his own garage bands and had dreamed of becoming a rock star. He was known for his infectious sense of humor, his big heart, and his love for his daughter, Crissa Ann. Christopher was a creative and selfless soul that lived every moment to the fullest, and gave everyone he met unconditional love. His personality brightened every situation he was apart of, and he made a standing impact on every life he touched. He is survived by his daughter Crissa, his parents, his sister Erika Schmidt, step-daughters Hannah and Amanda, Aunt Lynne Outland, nieces Courtney and Sydney, nephew Andrew, and his beloved Robin Seevers Lake. Anyone who knew Christopher loved him, and we all take comfort in knowing he is riding his motorcycle into the clouds above, watching over all of us. Services to celebrate Chris’ life will be held at 1:00pm, Saturday, September 22, 2018 at Newcomer Casper Chapel. Remember the Christopher we all loved to be laughing, smiling, and playing beautiful music and please ALWAYS remember to wear a helmet when riding a motorcycle, somebody out there loves and needs you. Add your memories to the guest book of Christopher Jennings. I am so sorry for your loss. May the 'God of all comfort' be with you during this difficult time. I have personally found comfort from the promise at 1 Corinthians 15:26 where it states that very soon 'death will be brought to nothing'. Then, we have the prospect of being reunited with our loved ones right here on Earth (John 5:28,29). I truly hope this brings you comfort and peace. With deepest sympathies, Gra and family.